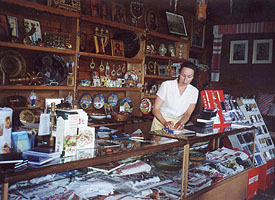 The Folk Art Shop, located in the right wing of the Grazhda, offers a variety of items for sale. 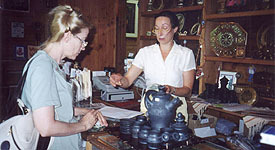 Ukrainian traditional handicrafts, books, artworks, greeting cards for any occasion, cassettes, CD's, embroidery, and much more fill the Grazhda shop. All proceeds are donated to St. John the Baptist Ukrainian Catholic Church. 4th of July -- grand opening of this year's Art Exhibit at the Grazhda. Summer brunch buffets every Sunday after Mass. Serving excellent traditional Ukrainian treats such as varenyky (dumplings), borshch, holubtsi (stuffed cabbage), not to mention the tastiest sweets -- all homemade dishes prepared by St. John parishioners. Enjoy Sunday buffets and the Art Exhibit throughout the summer season!